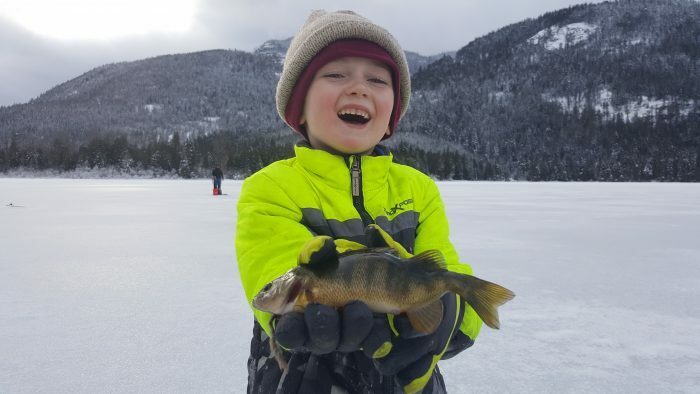 Kids don’t worry about things like catching a bucket full of fish or set goals for trivial things like 40″ northern pike or 30″ walleye. It doesn’t matter to them if they’ve got their jigging technique just right or how expensive jigs and bait are. Nope, they just want to help drill a hole and scoop ice out of it and ask questions about where maggots and meal worms come from. Maybe that’s why I prefer to fish with five year olds than my own generation. 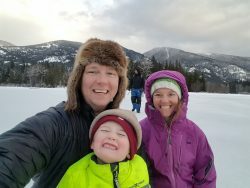 The purity of going fishing is lost when too many gadgets and numbers become the focus of ice fishing rather than than having fun. This past weekend my son caught a perch and then a few more. But in-between perch my wife and I pulled him around on the ice on a sled, drank some hot cocoa and had a snack. It was fun, plain and simple. We fished from about 11am until 4pm ran around on the ice and caught fish. Even a big sucker coming through the ice got him excited. Take a kid fishing for a few hours, catch a few fish then go have some hot cocoa and fry those fresh fish up. It just might be the best fishing day you have all winter. Make time for the little ones and don’t forget to learn from them. Things like fishing is fun, running around and kicking ice across the ice is fun too. I almost forgot that. I won’t forget again.